Today I am sharing with you one of my Husbands favorite dishes and mine too. I made these before my trip so I could freeze them so my Husband has something to eat while I’m gone. This is a classic recipe that I have been making for almost 20 years. Geeze I sound old! This recipe is pretty simple, but time-consuming. There are cheats you could use like using already cooked rice, microwaving your peppers ect… but I went the old fashion route. I boiled my peppers in water to soften them and I used instant rice for cooking in the meat mixture. Plus they have to bake for 30 minutes. Sounds like a lot of work, but so worth it! 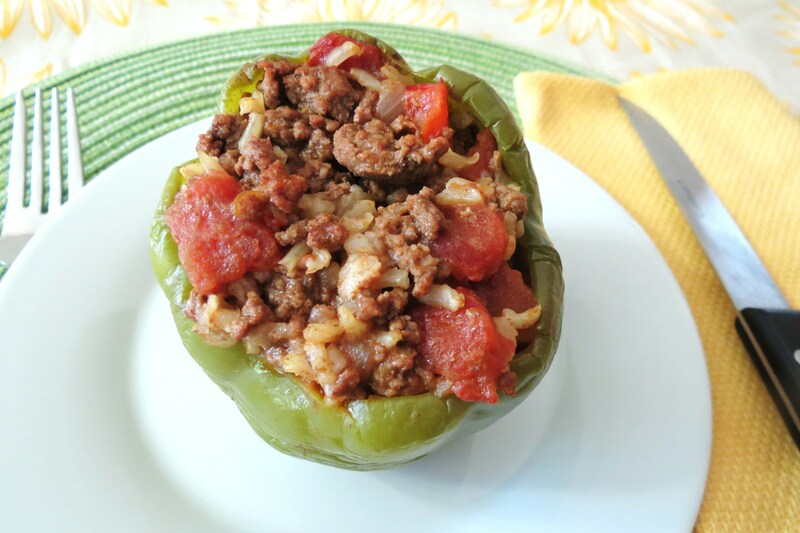 I really loved stuffed peppers! I was originally going to make hamburgers instead of peppers, but I was looking in my fridge and saw I have a ton of veggies to use up, so why not make my Husband one of his favorites? I asked him if wanted them and his face lite up! I how could I not make them for him? The first thing I did was boil my peppers, and then inverted them onto a paper towel to drain. 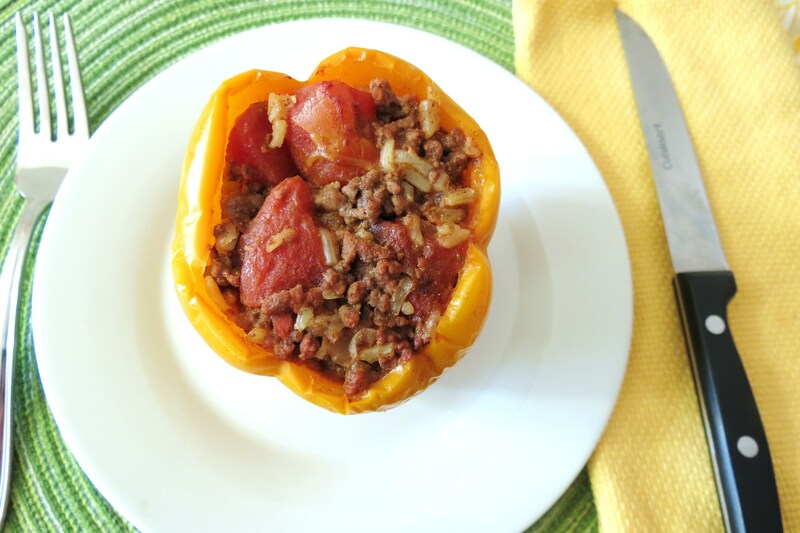 I had to use 3 different colored peppers, to me they taste pretty much the same in this recipe. 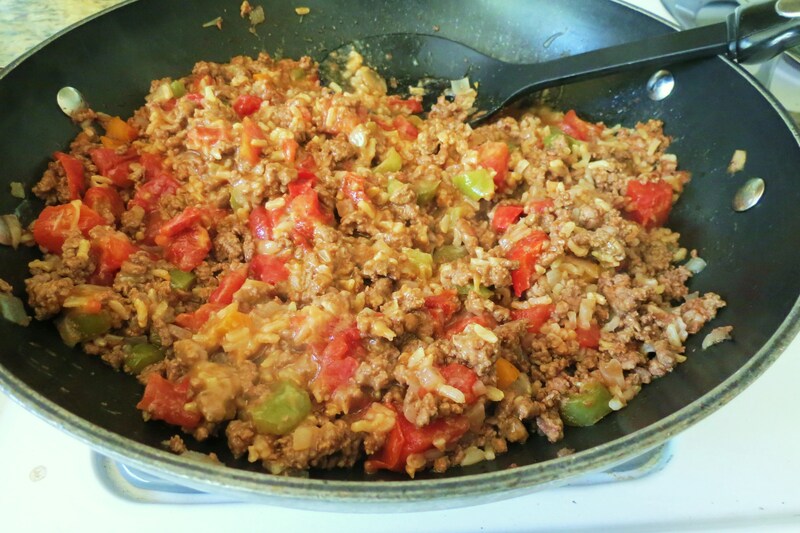 Meanwhile, I cooked up the lean ground beef with onions and peppers. I added a can of tomatoes, some Worcestershire sauce, rice and water. Cooked it until the rice was done, and then added shredded cheddar cheese, then baked them for 30 minutes in a 350 degree oven. I kind of wish I didn’t freeze them, I would have loved to of had one. Maybe he’ll save me one? These don’t look like much when there done, but they are so filling. One pepper is enough for anyone! I let my peppers cool to room temperature than I put them in a freezer safe container. Note for Hubby, when your ready to eat them, just microwave them for about 3 minutes. That should be enough time. 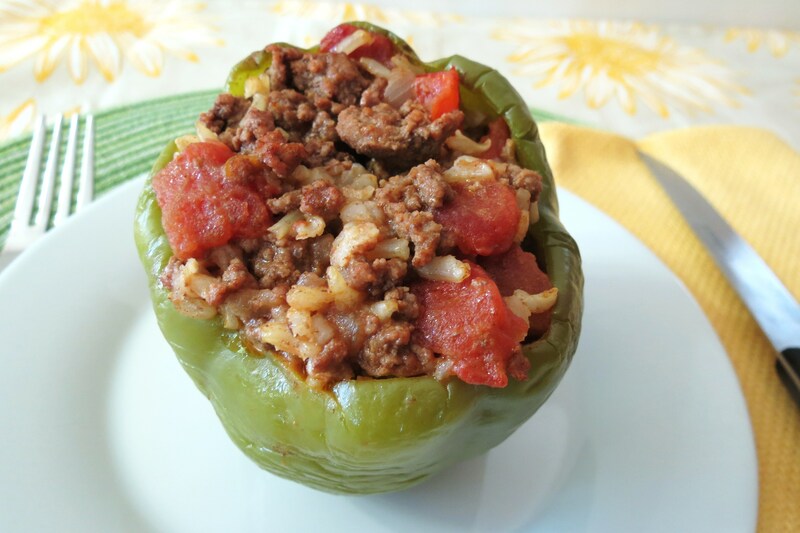 A traditional stuffed pepper made with ground beef, tomatoes, rice, onions and peppers and then baked. Cut tops from the peppers; discard seeds and membranes. Chop enough of the top to make ¼ cup, set aside. 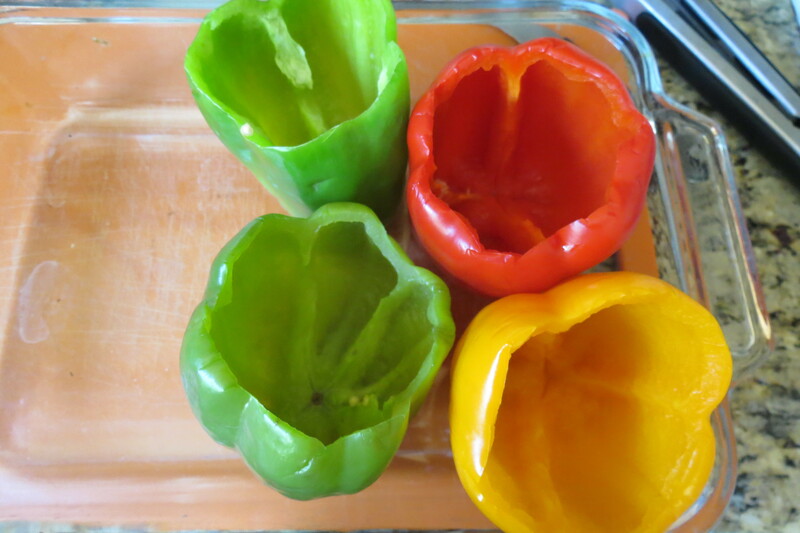 Place peppers in boiling water for 5 minutes. On a paper towel, invert peppers and let them drain. 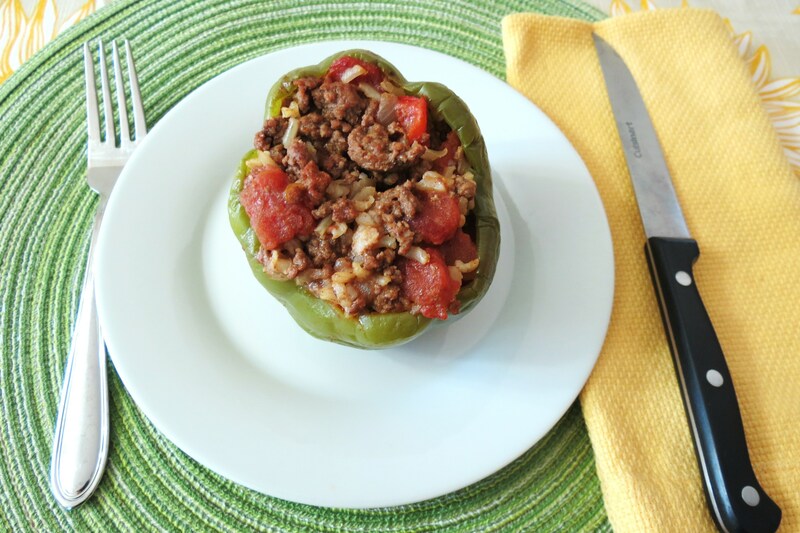 In a skillet add ground beef, onion, ¼ cup of diced pepper cook till meat is cooked and browned. Drain off an access fat. Add undrained tomatoes, uncooked rice, ½ cup of water, Worcestershire, parmesan cheese and a dash of pepper. Bring to a boil, reduce heat. Cover and simmer 15 to 18 minutes or till rice is tender. Stir in cheddar cheese. 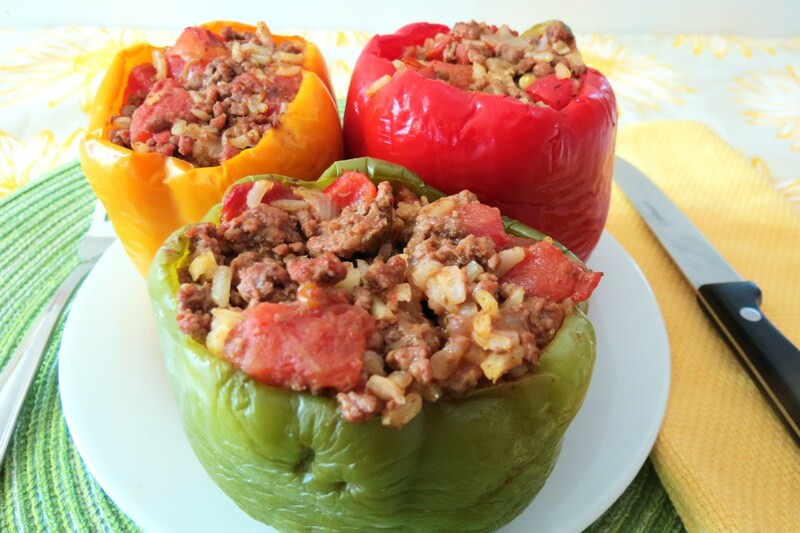 Stuff peppers with meat mixture. Place in a 10 x 6 x 2 inch baking dish. Bake, covered in a 350 oven for 30 - 35 minutes. Sorry I didn’t take a picture of the inside of the peppers. Since we weren’t eating them tonight, I wanted to keep them whole. Thanks Lauren! I love them too!! I would of made them veggie style stuffed quinoa, but my Husband would not of liked that! I think you’ve ensured that your husband will be grateful to have you in his life every day while you’re gone! These look awesome. Ahhh thanks Joanne! i hope he reads your comment and feels that way! I ate these growing up and they bring back delicious memories, I had almost forgotten about them, thanks, Jen! Have you left yet for your dream trip? I’m excited for you! HiChris, Nope I haven’t left yet, I leave first thing in the morning and I won’t return until the following Sunday night. I’m excited, but dreading the 20 hour travel day! Ugh! My step-daughter doesn’t like bell peppers, so I set a side just the filling for her and she loves it!! This is one of my husband’s favorite foods, too! I will have to make this for him! Oh you should! There so good!! Has anyone tried to substitute quinoa for the rice? Nope, but I think that would be a fantastic idea! I know it will work great!! Same water measurement of i use quinoa instead? Making tomorrow! ! Yes, you should be good. Quinoa is normally a 2 cups water, 1 cup quinoa. 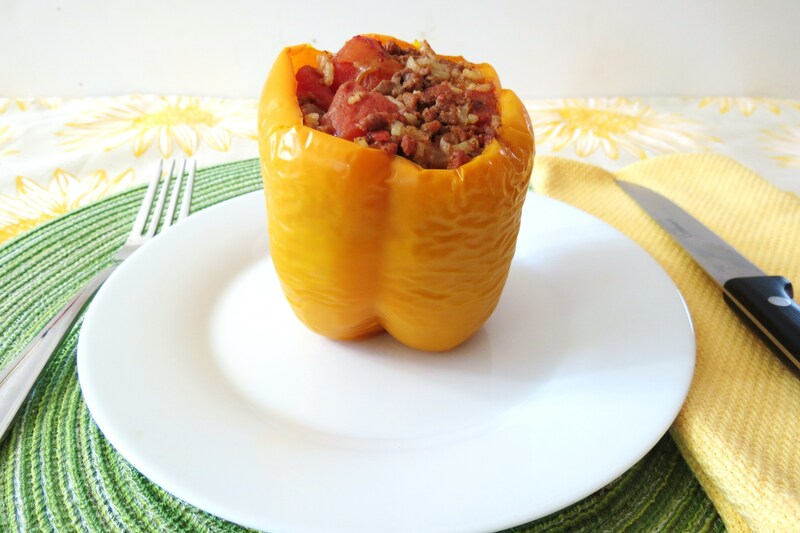 I love the idea of quinoa in stuffed peppers. This might be a stupid question but can I use white rice instead of brown? Hi Lisa, I am so glad you like it. It’s one of my Husbands favorites and mine too. I have in the past used white rice too and it turns out just as great with either or. If i make this recipe with fresh tomatoes from my garden, how much water should i put in? or will the juices from the tomatoes be enough? Is that 1/2 cup rice or 1/2 box rice?